And just as we achieve some Forge-less momentum…. oh well, it was too good to be true. Hex’s past jumps up to slap him in the face, and all of the Doctor’s pigeons come home to roost. Nearly all of them, anyway. We’re back to St Gart’s and a terrified London haunted by a powerful alien virus. Again the Doctor’s scheming comes to naught and he’s struggling, out of his depth, but unlike say Davison’s Doctor, who is just behind the beat, Sly’s Seven is buried under ever more overpowering foes. Sometimes he’s a little too much of a superhero, a bit too much like the modern TV version of himself, virtually indestructible, with all the mortality passed on to his companions. And yes, the virus has a bodycount, but it’s almost incidental alongside the Forge aspects of the story, with Hex discovering the truth about his past and Nimrod doing the gloating, vengeful bad guy part to the hilt. I’ll be fair. It’s not as bad as it could have been, but being Forge-related, it’s so heavily laden with continuity that I struggled to listen to it. 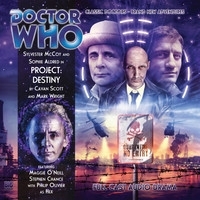 There are some odd inconsistencies in the characterisations and the plotting – Ace goes out vamp-hunting, albeit reluctantly, UNIT are absolutely nowhere, there are ever more layers of secrets and revelations for the Doctor and Nimrod to play off against each other, and poor Cassie gets half-resurrected as a hungry beast just to cap it off. The real problem is that it’s not the sort of Doctor Who that I can get behind. It feels far more suited to a modern-era Torchwood story than a Main Range effort, and there’s little in it that either takes the Seventh Doctor forward or harks back to the TV series. But, at last, possibly, we’re finally free of the Forge. And instead, there’s a puzzle – who on earth could have left a sealed Time Lord coffin in the basement of the Forge’s secret lair? And who could possibly be in it…?